Of course our customers expect 100% of their KPIs to be met on every job. They also need their transport solutions to develop alongside changing demands. 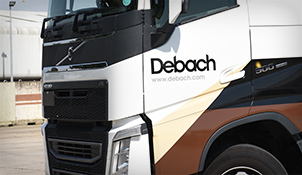 At Debach, we innovate. When we’ve developed an efficient transport system, we’ll adapt it to accommodate market fluctuations. It’s what helps us keep on top of our job and you on top of yours. 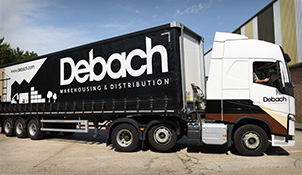 Our trucks are fitted with Euro 4, Euro 5 & Euro 6 engines with a strategy to completely move to vehicles with Euro 6 engines. These not only increases fuel efficiency – enabling us to make best use of fuel budgets in an increasingly volatile market – it means that we can work in a more environmentally-friendly way. The approach works better for us, you and the environment we all live in. 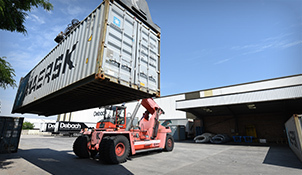 We can collect your containers from the Port after organising their release, then restitute the empties once they are unloaded at our warehouse.